Muffin tops. Everyone loves them. Most of us have them (not the good kind). But this is one of my favorite seasons to get my muffin baking on because of all the delicious fresh fruit that is in season. Especially, blueberries. 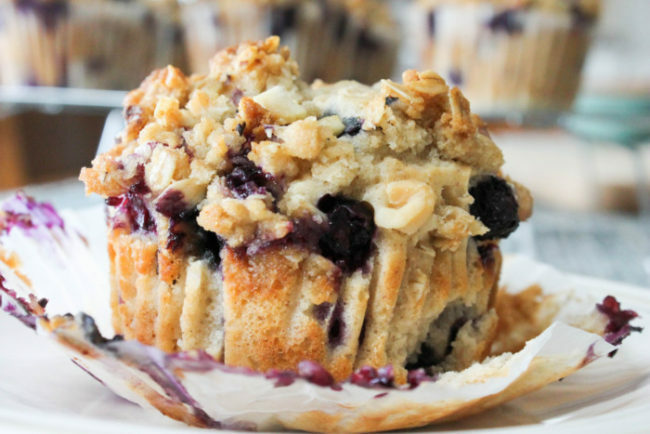 There’s nothing better than whipping up a batch of fresh muffins on a weekend morning that are bursting at the seams with fresh juicy blueberries. 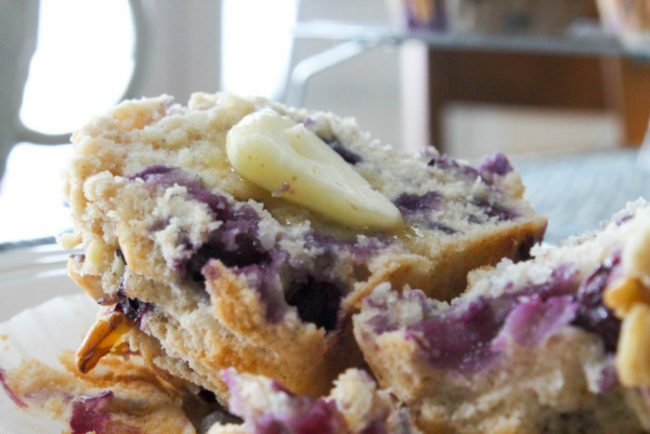 The best part about these blueberry muffins is definitely the top. 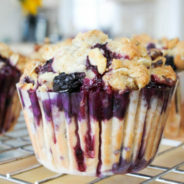 I’ve overloaded them with a cinnamon sugar streusel topping that gets nice and crunchy in the final few minutes of baking, so that right out of the oven you’ll bite into a crunchy muffin top packed with fresh blueberries. 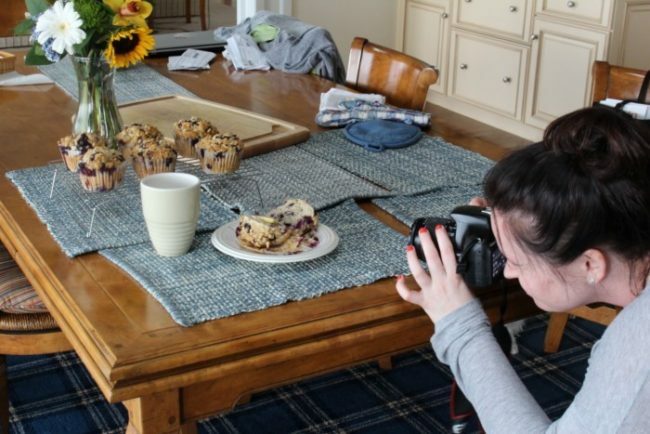 Looking back, I’ve actually been baking up blueberry muffins since I was a wee little thing in the kitchen. Though I’ve come a long way from the powdered store-bought blueberry muffin in a bag “just add oil and eggs” mix with dehydrated berries. 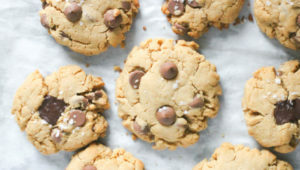 But I do have very fond memories of getting down to the kitchen early on a Saturday morning to whip up blueberry muffins (my favorite) and corn muffins (for my brother) so that when everyone came downstairs they had fresh out of the oven muffins. This past weekend for Mother’s Day my mom and I took a DSLR class at Orleans Camera down the Cape to learn how to use the fancy cameras we have had for years. Our only regret was not doing this years ago. The class was awesome. The instructor broke down all of the fancy components of our cameras into easy to understand lessons on what each setting does, how to use it and examples of when you would want to use it. On our way home we stopped at the grocery store so I could pick up ingredients to bake something up for us to test our newfound photography skills on. With the fruit section bursting with cartons on cartons of blueberries, I figured a good ol’ muffin recipe would do the trick with the contrast of blueberries against the muffin base. 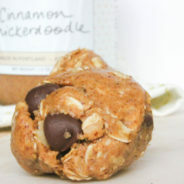 I love making muffins because you just throw everything in a bowl and use a wooden spoon to mix it together. No softening of the butter, or whipping out the big mixer. 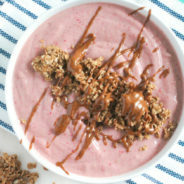 And it’s so easy to experiment with flavors. If blueberry is not your thing, you could do a lemon + raspberry version of these, or blackberries, or even banana if that floats your boat. I am also a big fan of using the Texas-sized muffin tins to make bakery style muffins for a few reasons. Everything is bigger in Texas. Including the muffin tops. These jumbo pans mean bigger muffins and bigger, crunchier muffin tops. I also like that you can say I “just ate one” muffin, but really it’s like two … but technically just one. I mean look at that giant thing of breakfast beauty. I added some walnuts into the streusel at the last minute to add a little extra crunch, and it was the perfect addition of crunchy texture and nutty flavor. 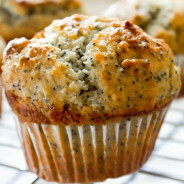 If you want to bake these as regular-size or mini muffins, here is an article with some tips on how to convert the baking times for different sized muffins. Go big or go home. That’s my view on cutting a hot muffin in half and throwing a slab of butter on top to melt into all the nooks and crannies. 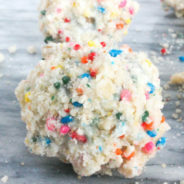 Definitely not gonna get bikini body ready with a batch of these, but you will start your Sunday morning off on a delicious foot. 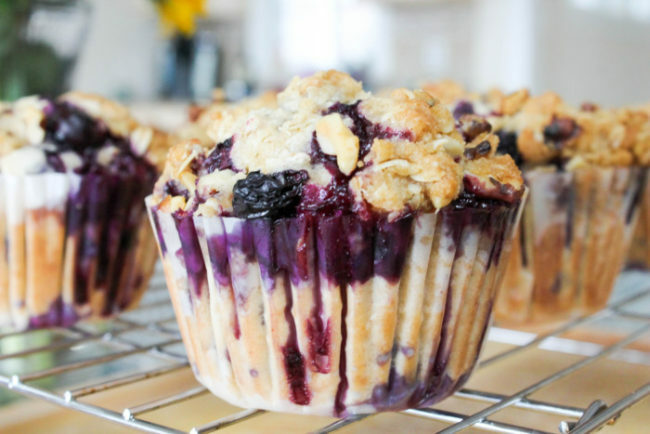 So take advantage of all of the great deals on fresh blueberries this season and bake up a batch of these Blueberry Streusel Muffins! 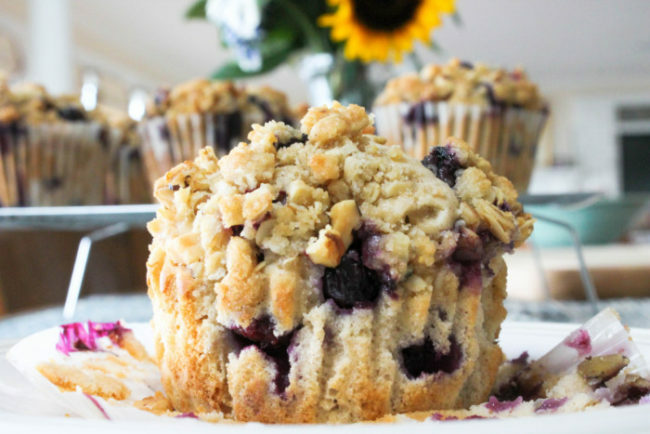 Bursting with fresh blueberries and generously topped with a crunchy streusel, these muffins are definitely a great way to start your morning off on the right foot. Preheat the oven to 350°F. Spray two jumbo-muffin pans with paper muffin liners and non-stick spray. To make the streusel topping, melt the butter in a microwave safe bowl and stir in the vanilla extract, sugars, oats, flour and nuts with a fork until crumbly and set aside. 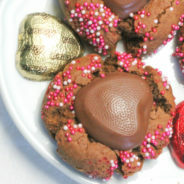 To make the muffin batter, in a small bowl whisk the dry ingredients together - flour, baking powder, salt - and set aside. 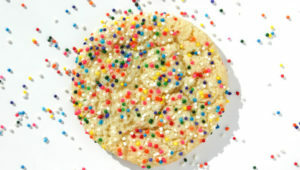 In a large mixing bowl, whisk together the melted butter, sugar, eggs and vanilla extract. Slowly alternate adding in the dry ingredient mixture and milk until the ingredients are evenly incorporated. 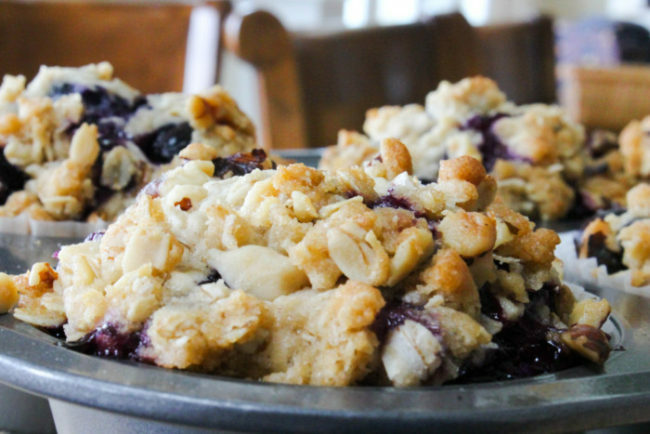 Fold in 1 1/2 cups of blueberries just until evenly distributed, saving the other 1/2 cup for the top. 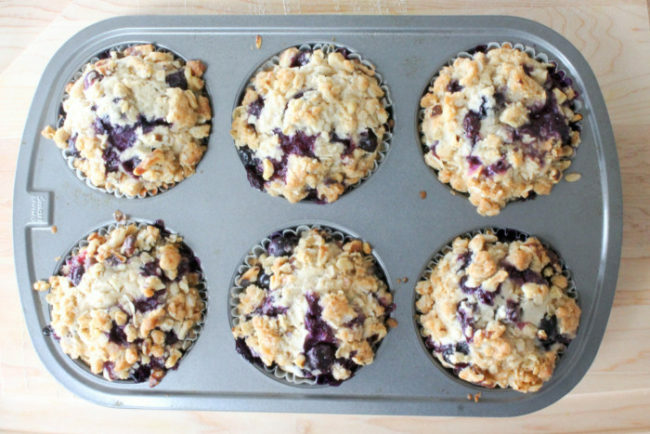 Fill the muffin tins evenly with the batter and top with the remaining blueberries. 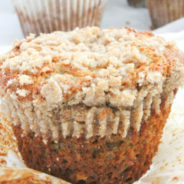 Sprinkle the streusel evenly over over the batter to cover the top of each muffin. Bake at 350°F for 25-35 minutes until the tops are golden. 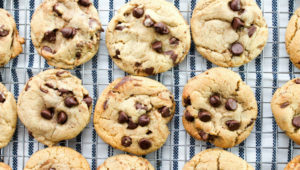 Let them sit on top of the oven for a few minutes before transferring to a wire rack to cool, or enjoy them warm! These are seriously perfect. 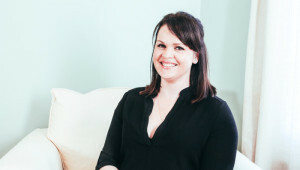 And those photos!! Gorgeous.